Mainistir na Corann – the origins of the market town in 1608. 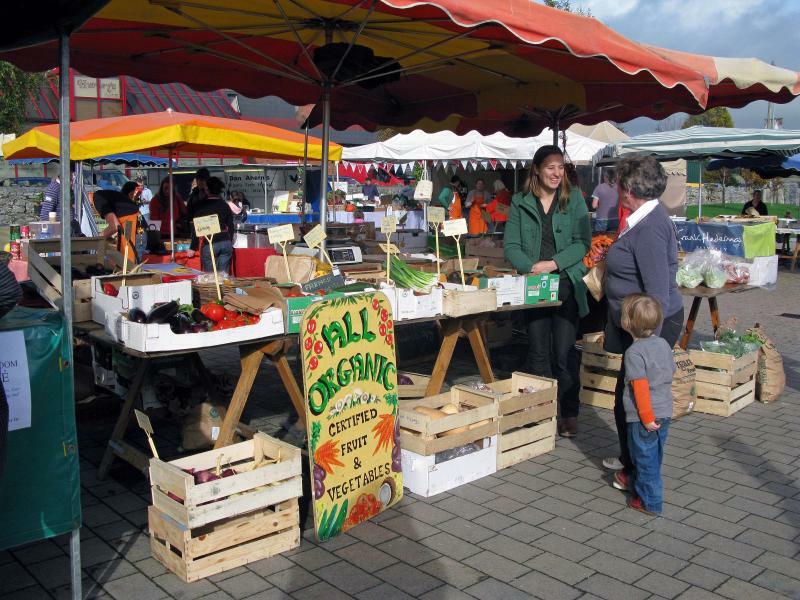 Midleton Farmers Market was founded in the year 2000, but the founders didn’t realise that their preferred market day, Saturday, was the very same day designated for a market in 1608! On Saturday, 30th May 2015, Midleton Farmers Market celebrated fifteen successful years of business. But little did the founders of this market realise in 2000 that their decision to hold the market on Saturday actually chimed with the earliest evidence for a market town at Mainistir na Corann or Corabbey. It really proved to be a serendipitous decision by the Midleton Farmers Market! 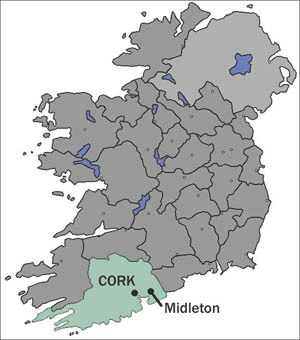 When exactly did the town now called Midleton actually begin? The truth is we’re not really certain. But we do have one date that certainly suggests a town either existing on the site, or being developed – 1608. There is some evidence for an earlier town or village – it comes from maps made during the sixteenth century by Continental or English cartographers working for the Crown. 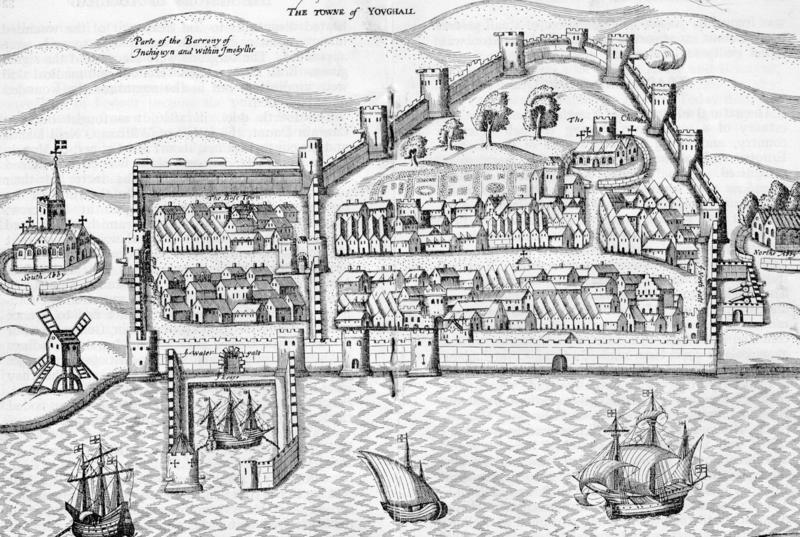 Maps by Robert Lythe showing M Coragh (1571), Abraham Ortelius showing Cor (1573), and Francis Jobson showing Coragh (1589) all suggest the presence of a town or village at the site of the abbey. Robert Lythe’s map is especially precocious given its accuracy. Clearly there was something on the site – and not just the old abbey (whether in ruins or intact). 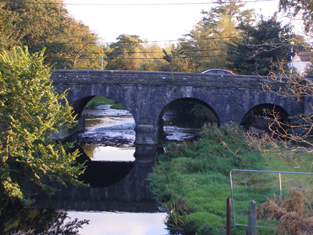 Midleton Bridge or the Cork Bridge spans the Owenacurra at the northern end of Midleton. As can be seen from the photograph, the riverbed here is quite shallow and makes an excellent ford. Paul McCotter has produced evidence that suggests that there may have been a settlement in the area before the monastery was founded in 1180, and that it developed further after the foundation of the monastery. He notes the name Drohidfinagh (or Droichead Fineadh) which may refer to a settlement near the present Cork Bridge in Midleton. That area, at the northern end of Main Street later included the Fair Green. The current bridge was built on the last crossing point on the Owenacurra. Indeed the short stretch of the riverbed immediately north and south of the modern bridge is quite shallow, and is easily fordable, especially after a spell of dry weather. But the stream above and below this short stretch is deeper and less easily forded. It should be noted that Drohidfinagh is not a name in current use in Midleton. The name appears to suggest a community bridge – but this is a community in the sense of a clan rather than a community in the sense of a settlement. Perhaps the name refers to the ancient Gaelic chieftans, the Mac Tire, whose family dominated the area before the arrival of the Anglo-Normans in 1177/78. Despite the fact that we have a record of the possessions of the Cistercian Abbey of Chore (Mainistir na Corann) from 1541, that record does not show clear evidence of a town or village attached to the monastery. It isn’t until the former monastic estate was transferred to a new leaseholder, John FitzEdmund FitzGerald of Cloyne, in 1573 that things begin to change. It is unknown the abbey buildings were damaged during the First Desmond Rebellion (1569-73), but it should not surprise us if some harm was done. The Second Desmond Rebellion (1579-83) was, however, much worse. 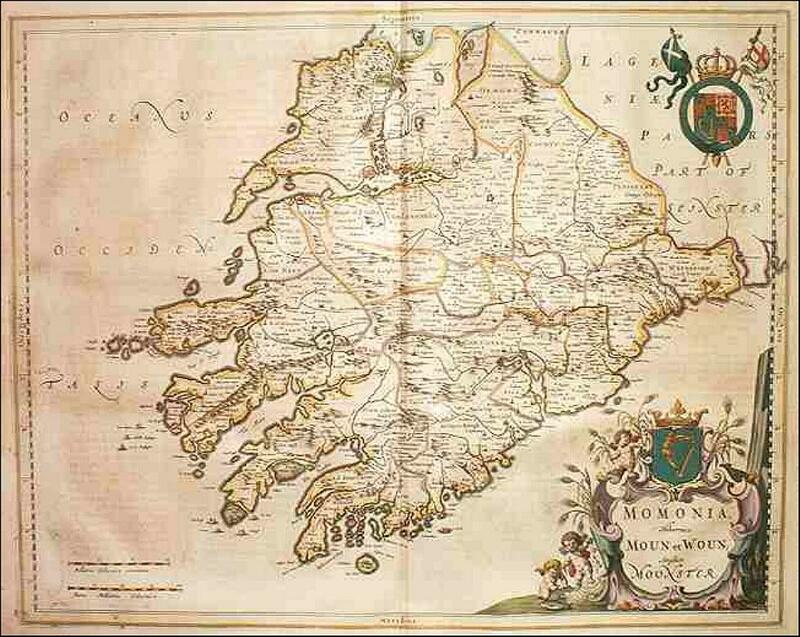 Mainistir na Corann, as we have noted, had already appeared as M Coragh on Lythe’s map which was based on a survey of Imokilly and East Cork conducted between November 1569 and January 1570. The town or village was clearly on those maps made up to 1612 usually under variations of Cor, Corabbey, M Cor, M Coragh. Clearly the place was developing into a town, but ,with the late sixteenth century wars. it didn’t have the most auspicious start. The Second Desmond Rebellion did enormous damage to the fabric of buildings and to the local economy. John FitzEdmund FitzGerald of Cloyne claimed that he had lost some 3,200 head of cattle (valued at £2,160), over 1,000 horses (valued at over £1,000) and 21,000,sheep and goats (valued at over £2,100). Additional losses included 1,400 pigs (value £400) and five hackneys and five mares (valued at £20). With other losses, FitzGerald estimated he had lost property valued at over £6,160 by the summer of 1581. He didn’t include the burning of Cloyne and the burning of his castle at Ballycotton in these figures. Anthony McCormack reckons that John FitzEdmund FitzGerald had sustained losses of over 310,000 sterling by the close of the war. This was a huge sum, even for one of the greatest and most crooked land-grabbers in Ireland! McCormack estimates that out of the 150,000 strong population of Munster, some 48,600 people may have died of war, starvation, disease and plague during this rebellion. Cahermone Castle was acquired from impecunious FitzGerald relatives in 1571 by John FitzEdmund FitzGerald, who built the walled garden seen on the left. He also added a more modern house on the right. Clearly FitzGerald had his eye on the monastic estate of Corabbey. Cahermone stands at the edge of Midleton town. It is worth noting that John FitzEdmund Fitzgerald of Cloyne was a Catholic who was totally loyal to Queen Elizabeth; an illegitimate son, he had become the Dean of Cloyne Cathedral in succession to his father and kept the cathedral operating as a Catholic place of worship until his death in 1612! One wonders if he also maintained a small community at Chore Abbey. Sadly there would be another war at the end of the sixteenth century when the two Ulster lords, Hugh O’Neil and Red Hugh O’Donnell, brought their forces south to join the Spanish at Kinsale – Imokilly was seriously spoiled by the northern army in its search for provisions. FitzGerald had first moved into the area of Mainistir na Corann/Corabbey in 1571 when he acquired the neighbouring Cahermone Castle from some impecunious FitzGerald relatives..
On 14th October 1608, Sir John FitzEdmund FitzGerald (he had been knighted in 1601) was granted a license to hold a weekly market at Corabbey. Market day was to be on Saturday – just like today’s Farmer’s Market! Sir John had to pay an annual ‘rent’ of 5 shillings in English currency to the Crown for the license. He was now obliged to appoint a place for the holding of the market and to police this market by means of a clerk of the market and a piepowder court. This latter was a summary court that settled disputes on the spot between traders and their clients. It took its name from the old French term pieds poudres or ‘dusty feet.’ All stall-holders had to pay a fee (either a portion of their goods or give the equivalent value in currency). The fines from the piepowder court and the market fees represented quite a profit for the landlord, especially since the fees could be collected weekly. It’s worth noting that in the following year, Sir James Craig was granted a license to hold an annual fair at Castleredmond on 3rd of May and one day following. 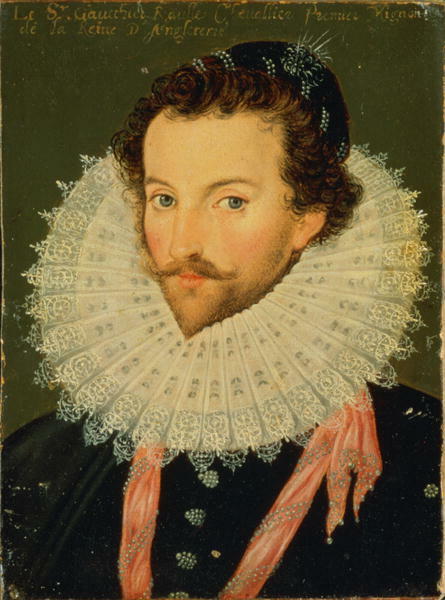 The Elizabethan adventurer, Richard Boyle, first Earl of Cork, acquired the estate of Corabbey some time after the death of Sir John FitzEdmund FitzGerald in 1612. Strangely, nobody ever talks about him in the context of Midelton’s history. He’s Midleton’s forgotten figure really. 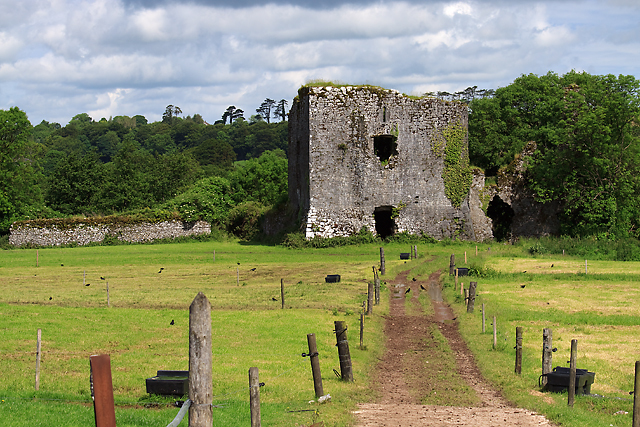 By the 1620s, the monastic estate of Corabbey had clearly come into the hands of a new leaseholder – the formidable Richard Boyle, first Earl of Cork. An extraordinary property-developer, Boyle applied for and was granted a new license for a market in Mainistir na Corran/Corabbey. This license was granted on 23rd December 1624 and it too designated Saturday as the market day. Boyle was charged 6 shillings 8 pence (Irish currency) each year for this privilege. On the same day he was granted a license to hold an annual fair in Castleredmond on 3rd of May and two days following. One interesting context for these market licenses – there is no record of such a license being issued for Ballinacorra village. Nearby locations like Rostellan, Dangandonovan, Carrigtohill, and even Killeagh are recorded as having a licence for a market or fair or even both. This suggests that these areas are held by influential landlords and have a sufficient population and commerce to warrant the issue of such licenses. None of the men mentioned above would have applied for their licenses if they didn’t believe in the commercial opportunities that would benefit them. It seems highly unlikely that a license would have been issued if the applicant could not demonstrate a realy local need for a market. Clearly there must have been a town developing at Corabby/Mainistir na Corann to sustain all this activity – the market town that became Midleton was born. It is obvious that, if he didn’t found the town, then Sir John FitzEdmund FitzGerald was intent on developing it, as was Richard Boyle, Earl of Cork. I understand that the founders of Midleton Farmers Market had absolutely no idea that Saturday was the original market day designated in 1608 and reaffirmed in 1624. They chose the day because it is a popular shopping day in Midleton. Serendipity indeed! Sources: Margaret Curtis Clayton, ‘Early Stuart markets and fairs in Munster, c1600-1630’. Journal of the Cork Historical and Archaeological Society, 2010. Anthony McCormack, ‘The social and economic consequences of the Desmond rebellion of 1579-83.’ Irish Historical Studies, May 2004.